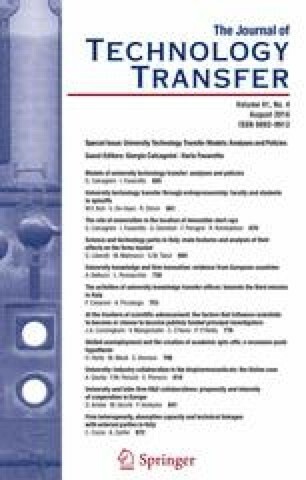 This research informs our understanding of the technology commercialization process in university spinoffs, focusing in particular on student involvement in the early phases of the spinoff development process and on the impact of the larger university ecosystem. Detailed case studies indicate that graduate and post-doctoral students are important participants in university spinoffs. We offer a typology of spinoff development with four pathways, based on the varying roles of faculty, experienced entrepreneurs, PhD/post-doctoral students, and business students. The effects of the larger university ecosystem, beyond the university technology transfer office and the university’s commercialization policies, are also considered, including an examination of programs and practices that may influence this process. We close with a discussion of guidelines for technology transfer and spinoff development at universities, based on the findings of this research. The authors gratefully acknowledge the research and editorial assistance of Alyse Freilich, Jared Konczal, and Mette Kramer. This study was supported by the Ewing Marion Kauffman Foundation. The views expressed are those of the authors and do not necessarily reflect the views of the Ewing Marion Kauffman Foundation. Hoffer, Thomas, B., Milesi, Carolina, Selfa, Lance, Grigorian, Karen, Foley, Daniel, J., Milan, Lynn M., Proudfoot, Steven L., & Rivers, Emilda B. (2011). InfoBrief SRS: Unemployment Among Doctoral Scientists and Engineers Remained Below the National Average in 2008. National Science Foundation NSF 11-308. http://www.nsf.gov/statistics/infbrief/nsf11308/nsf11308.pdf.